The misuse or takeover of privileged accounts constitutes the most common source of breaches today. 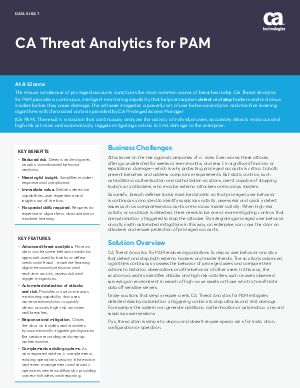 CA Threat Analytics for PAM provides a continuous, intelligent monitoring capability that helps enterprises detect and stop hackers and malicious insiders before they cause damage. The software integrates a powerful set of user behavior analytics and machine learning algorithms with the trusted controls provided by CA Privileged Access Manager (CA PAM). The result is a solution that continuously analyzes the activity of individual users, accurately detects malicious and high-risk activities and automatically triggers mitigating controls to limit damage to the enterprise.